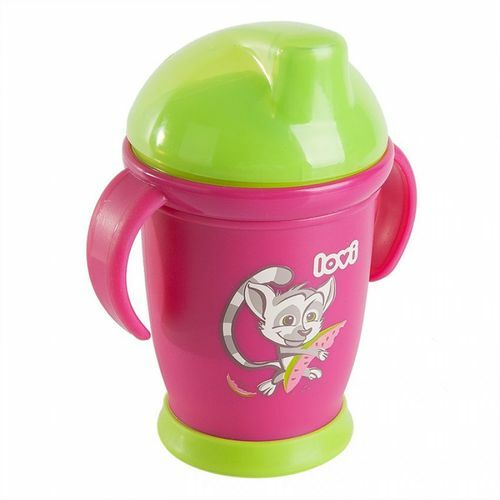 The Lovi BPA free non-spill cup has a one-way valve fixed in the spout so liquids don?t spill even when your baby is throwing the cup around. The valve has patented technology of silver granules to kill 99% bacteria (E.Coli & MRSA) within 24 hrs. of use. The baby drinking cup handles are covered with soft rubber for easy grip. The Rubber tipped broad base makes the non-spill stable on flat surfaces. The Soft, rubber coated body has no sharp edges to cut your baby's hands. A cover keeps the spout hygienically clean. Most hygienic option for active toddlers, outdoors or at home. BPA free, non-spill cup with one-way fixed spout valve. Kills 99% bacteria with Steritouch Protection (E.Coli & MRSA). Simple design affords easy cleaning. Rubber coated, soft handles for tiny hands. Rubber tipped broad, stable base. Comes with a hygienic cover. Toddlers are extremely active so they are exposed to infections, especially stomach infections. Sturdy: Does not leak even when thrown around by the baby. Material: PP, TPE, PE Valve: Silicone. 1x 250 ml cup, 1x spout cap, 1x handle,1X cover.